Chamomile tea is one of the best known and loved of all herbal teas. Whenever you feel ill, stressed or just plain under the weather, someone is always bound to recommend a nice cup of this herbal tea. And this is with very good reason because chamomile has long been known as a medicinal cure-all. This tea is a must-have in your pantry, so come and find out the many symptoms this wonderful herb may help to soothe. find out why chamomile is worth a place of honor in your herb collection. 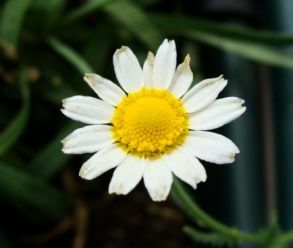 Chamomile is a daisy-like flower with little white petals and a yellow center. The name chamomile actually means “ground apple” because this herb grows close to the ground and has a fragrance similar to that of an apple. There are two main species of chamomile: Roman chamomile (anthemis nobilis in Latin) and German chamomile (matricaria recutita in Latin). These plants are used interchangeably to make a tea with similar calming effects. Roman chamomile, also known as lawn chamomile, is a perennial species native to Europe and North America. It is the smaller of the two species reaching a height of 30cm (approx. 1ft) at the most. Leaves are of a greenish-grey color and feathery. The flowers, which are daisy-like and have an intense aroma, bloom in the summer. German chamomile, also spelled camomile, is an annual species and it is native to most of Europe and the temperate regions of Western Asia, though has become naturalized in the US as well. It may reach a height of 60cm (approx. 2ft), has bright green leaves and has the same characteristic small daisy-like flowers that bloom in early summer. Both species have the renowned soothing effects and intense floral aroma that have made chamomile such a beloved herb throughout the years. Chamomile tea has a long history of use for medicinal purposes. Ancient Egyptians loved this tea for its wonderful healing powers and used it as remedy for all kinds of ailments, internal and external. It was considered a sacred herb, a symbol of the sun god Ra. Romans and Greeks also used this tea both for its wound healing properties and as a beverage. As the centuries passed, people in Europe kept on using this tea for insomnia, pains, nervous states and other ailments and then helped to spread its use to the Americas. 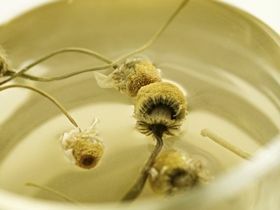 Today, the chamomile infusion is still considered one of the best herbal teas, particularly for children. The herb is used in aromatherapy and made into potpourri and herb pillows for the sedative properties present in its essential oil. It is highly valued in the cosmetic world for its floral perfume. Chamomile herbal tea is rich in a great deal of substances, making it a wonderfully healthy herbal tea. It contains essential oil, flavonoids, phytosterols, tannins, coumarins, glycosides, vitamins B and C, minerals like calcium and magnesium, and also protein. Feeling queasy and sick? Does your stomach hurt and feel full? Then brew a pot of chamomile tea and drink a few warm cups of this infusion. It helps to soothe and treat stomach problems. This tea actually helps improve your digestion and stimulate your appetite. Did you know that stress and tension can manifest itself through stomach pain? It may cause heartburn, nausea and even vomiting. So you drink this calming tea and you will relax and heal. Once done with your stomach it will then also benefit and regulate your intestinal tract, easing symptoms of irritable bowel syndrome and dealing with inflammation that may be causing you to feel bloated and suffer flatulence and pain. Chamomile tea is the ideal herbal tea to drink when you are suffering from stomach flu, diarrhea or constipation. It relaxes the smooth muscles of your digestive tract. Blend it with peppermint for a soothing and refreshing cup of tea. Here’s a tip: Start the healing process with the mouth. Gargling this tea will help treat and disinfect the mouth, helping gums to heal and even relieve a toothache. Stress and anxiety can prevent you from getting much needed sleep and can cause serious strain on your body that manifests itself in stomach problems, heart issues, mental exhaustion and even skin disease. So why not take a break and have a calming cup of tea? Take a cup of chamomile infusion before going to bed and get calm and restful sleep. If you are battling insomnia you can even try taking a warm bath before bedtime, scented with the cooling floral aroma of chamomile. Take this tea during the day and it will help you reduce the stress and irritability of your daily routine. It is a mild natural sedative that relaxes the nerves and eases tension bringing relief to stress-related headaches. Take it as soon as you feel a migraine coming on. Don’t let it settle! Suggestion: blend your chamomile flowers with orange peel and laurel leaves for a headache reducing tea. It may also be helpful when dealing with light or mild states of depressions, with its calming and comforting nature that helps to reduce anxiety, support and nourish the nervous system. For more serious depressive conditions, seek advice from your doctor. Do you have a runny nose and can’t stop sneezing? Then have a cup of chamomile tea, its antibacterial action can help fight common cold symptoms. It helps to relieve your congested lungs and nose. Once your body is rid of the mucus, you will start to breathe better. This herbal tea is great at improving your immune system and fighting infection. That’s why it is so great at warding off colds and breaking fevers. It relaxes your respiratory system, which may be useful if you suffer from such ailments as asthma, hay fever or sinusitis. To treat your breathing difficulties you can either drink chamomile herbal tea or prepare it as a steam inhalant to bring relief to congested nose and lungs. Chamomile is a great herb that acts on many levels. As a tea it may also help to treat inflammations and infections that attack your liver, kidneys and bladder. More importantly, drinking this herbal tea daily may help prevent the progression of type 2 diabetes, thus reducing complications that may affect and damage your kidneys. In the liver, taking chamomile tea will help to treat cystitis and jaundice. It will help clear it of infection and improve the liver function. A healthy liver also means a good hormonal balance which in turn will affect your reproductive system in a positive way. Chamomile tea will help to regulate your menstruation and reduce symptoms of PMS. Drinking this herbal tea may also mean pain relief during your menstrual cycle, as chamomile is both analgesic and anti-inflammatory so there is less of a chance of you having menstrual colic or cramps. The benefits of chamomile tea center on the capacity of this tea to relieve pain; reduce inflammation and infection. Its antibacterial and antioxidant properties make it a great tea for both prevention and cure of ailments. This herbal infusion acts on pains resulting from muscle spasms, strains and rheumatism. It is analgesic and anti-inflammatory help your nerve and muscle tissues to heal but it also fortifies you against future health threats. Chamomile flowers also make a tea that is antiviral and anti-microbial, aiding your body in stimulating your white blood cells, your bodyguards against infection, giving your immune system a boost. A chamomile infusion can be used both internally and externally. Eyes, hair, skin and muscles can all benefit from a topical application of this tea. Let’s start with the eyes! Making a poultice with chamomile tea may be useful for overtired eyes and dark circles, and also for cleaning and treating pink eye, and other eye infections and inflammations. Apply chamomile tea to your hair as a rinse to highlight your blond hair or add a bit of golden lights to your brown hair. More than just lighten your hair, it will help prevent dandruff and soothe your scalp, by acting as a disinfectant and scarring agent. And finally, apply it to your skin to treat, clean and disinfect wounds, burns, cuts and scrapes. It may also be used for skin ailments such as psoriasis, eczema, acne or a diaper rash as it is an analgesic and antiallergenic. It will help alleviate the pain. Chamomile tea is antiseptic and antibacterial, so it may prove to be a great skin wash for such situations as bad and painful sunburn. Suggestion: take a chamomile bath to soothe and regenerate your skin. It will help with irritated or dry skin and lighten the skin tone. It may also be used on the skin to treat painful hemorrhoids, both disinfecting and treating the inflammation. The best thing about this tea is that you may give it to your baby or child. You may wish to confirm with the child’s pediatrician, but this should be a great herbal remedy for when your child is suffering from painful colic or teething. It will both soothe and treat. Even something as simple as an herbal bath with chamomile flowers may help to calm an irritated child. A calming bath is said to help with baby colic or with a child having trouble sleeping at night. Did your child eat too many sweets and is now complaining of an upset stomach? Did he throw up his dinner? Then prepare a nice warm cup of chamomile tea. It will both calm the child’s distress and help treat the stomach disorder. When suffering from a cold or fever, it is important to stay hydrated, so give your child a cup of tea. It will also fight the infection in the lungs, relieve a sore throat and help with other breathing difficulties. Add a bit honey to help with the inflamed throat and makes the tea sweeter and easier to drink. Take a sip of this soothing tea! Though chamomile herb has been used safely for many years and in many places around the world, there are still some aspects you should pay attention to. Chamomile’s calming nature can be harmful for those with low blood pressure, causing feelings of faint. Using this tea as a natural sedative, it should not be taken when driving. Chamomile tea can cause you to feel drowsy and be dangerous when you need to be alert. Some people may develop tolerance to chamomile’s sedative powers and too much of this tea can be harmful for your stomach. If you exceed the recommended daily dosage, you may start to feel nausea and even vomit. If you have sensitive skin, you may experience skin reactions and allergies if you drink too much chamomile tea. This is very rare, but if you experience any symptoms, you should stop drinking this tea. It may be tempting to drink a chamomile infusion when you are pregnant to deal with nausea. However, too much may contract the uterus and lead to miscarriage. Best check with your doctor to recommend a proper dosage for your particular case. 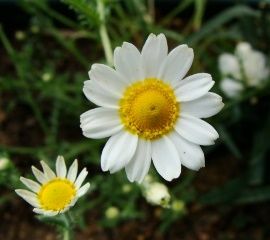 If you are allergic to plants such as the ragweed or chrysanthemums, if you suffer from asthma or have pollen allergies, then it is best not to drink chamomile tea. If you experience difficulty breathing or swallowing, cramps and general pain, stop drinking chamomile tea immediately and go to your doctor to get tested for allergies. Chamomile herbal tea may interact with medication you are taking. So make sure not to drink this tea if you are on blood thinners or if you take medication for epilepsy. The effects of the medication may be enhanced beyond safe levels. Chamomile tea is really easy to make so you can enjoy it every day. It is a mild tea which means it may be enjoyed over a long period of time. Here are few pointers on how to make chamomile tea. This herbal tea is made from the dried flowers and leaves of the chamomile plant. Keep your herbs in a tightly closed jar in a dark and cool place and only take it out when you need to make you tea. Start by boiling water. As you wait for the water to boil, prepare the teapot and cups. Place 2 teaspoons of dried flowers and leaves per cup of tea (approx. 250ml) in your teapot. Let steep for at least 5 minutes, but it may be better go for 10 minutes if brewing in a full teapot. Strain to get a delicate yellow tea with a wonderful floral aroma. This tea can have a rather bitter taste so sweeten to taste. Honey is a great choice if you drinking this tea when you have a cold or an upset stomach. If it is too bitter to drink, perhaps you have let it steep for too long or used too much chamomile. Adjust to your taste. Here are some tips to make your chamomile tea even better. For colds and flus, you may add a bit of lemon, for some added benefits. For digestive problems, this soothing tea works best if drunk 3 to 4 times a day, in between meals. Blend with peppermint or lemongrass, even a bit of ground ginger may help to bring back your appetite. Brew a cup of tea before bed if you are having trouble sleeping. Take time to prepare for bed as your tea steeps in your cup. Drink and relax. Turn off the TV and other distractions. Go to bed with a nice book, something that will help you sleep. Buy Your Chamomile Tea Today! 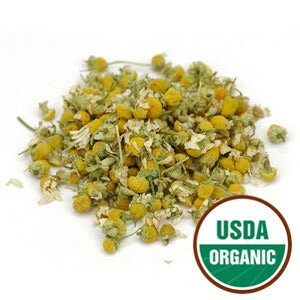 Click on the image or on the link below to purchase from Starwest Botanicals your Chamomile Tea. Pour a cup of tea made from these wonderfully scented chamomile flowers. Drink this mild, relaxing tea and feel it's soothing and healing properties. Buy your herbal tea here! So if you are feeling a bit under the weather, have a cup of chamomile tea! It’s the perfect cup of tea for you!